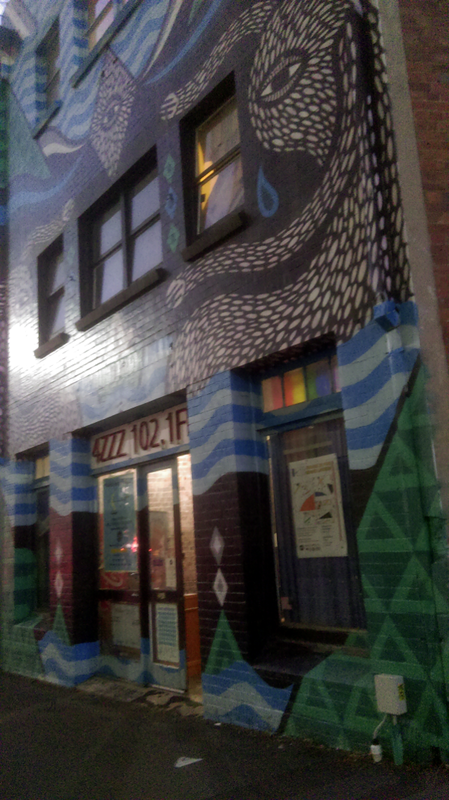 The Brisbane Bicycle Explorers Club recently put on a great evening recounting Brisbane’s rich music history including a tour of iconic Brisbane radio station 4ZZZ. As I mentioned the last time we met here, I had on the cards the Streets Of Your Town Brisbane Music Heritage Ride (part of Bike Week Queensland) pending the state of my wellness. Well, I’m happy to report that I did indeed attend the event, it exceeded my highest expectations and I recommend that anyone with a bicycle and a hankering for a great night out tag along to next year’s installment. Alighting at Roma Street Station with my Brompton firmly in hand and my Pixies t-shirt on back, I headed up Roma St to the famed Lefty’s Old Time Music Hall where I met the crew from the Brisbane Bicycle Explorers Club. 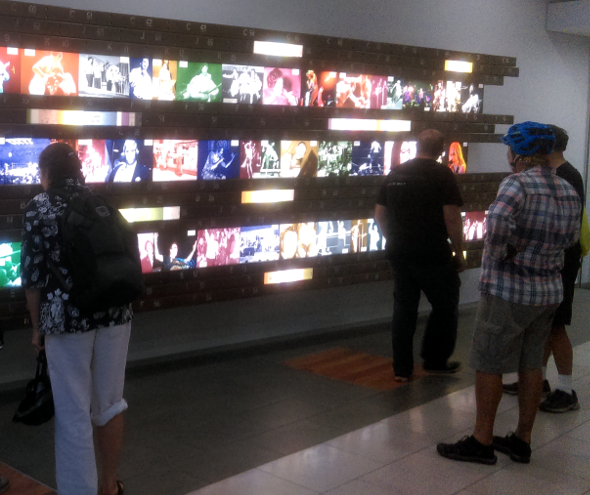 Yes, I know – The Pixies aren’t a Brisbane band. 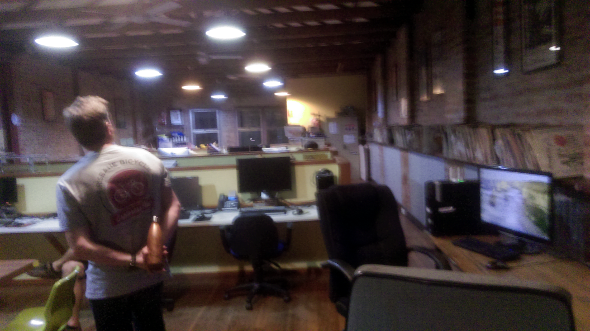 But this best conveys the mood of the night (to me). 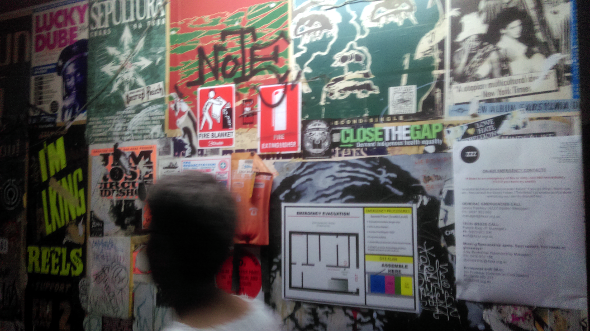 With a few formalities out of the way we meandered through Brisbane gazing at various pieces of street art and stopping to see musical landmarks such as the site of the old Festival Hall and the original sites of Cloudland and the Whiskey au Go Go. 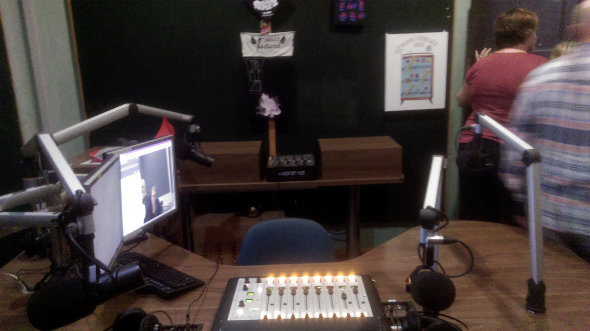 But the highlight of the evening was undoubtedly the tour of the studios of Brisbane’s very own radio 4ZZZ guided graciously by none other than one Mr Andrew Bartlett (and see more here). 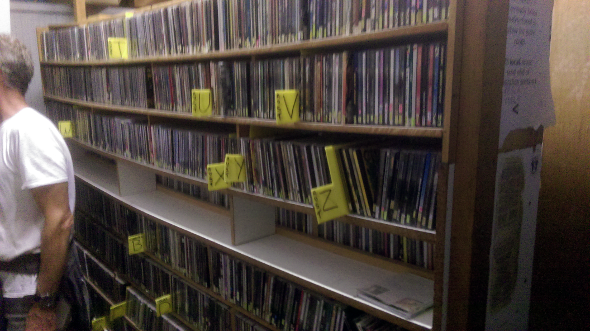 The absorption of 40 years of local radio history was pretty mind blowing as we toured the broadcasting studios, the priceless music library and admired the walls, stairs and doors plastered with decades’ worth of band posters, stickers and various random artistic tidbits. 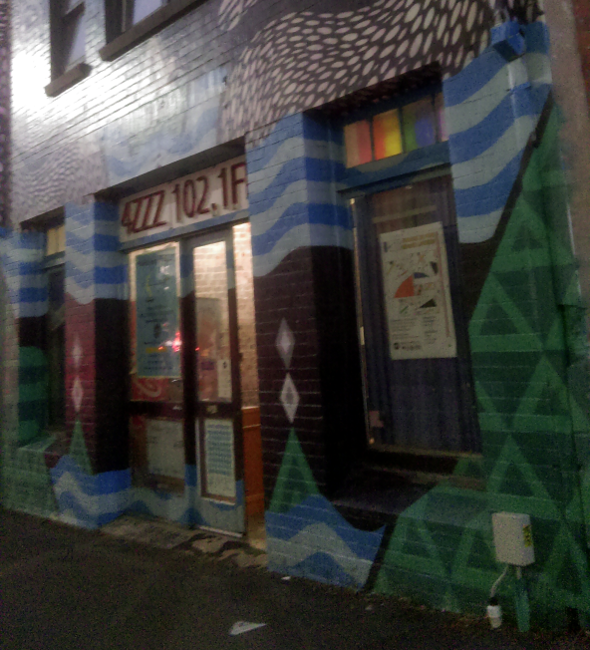 The vibe, the smell, the people all took me back to the Brisbane of my younger days and underscored that 4ZZZ really is part of the character of this city. 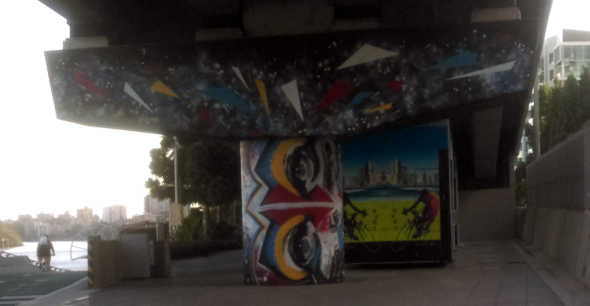 After the 4ZZZ tour, as the fifteen (or so) of us glided on our bikes through the cool evening air with the full moon above us and city lights around us, I felt a sense that what we were doing really is the way to get around a city. It felt akin to moving comfortably around my own lounge room amongst friends as opposed to driving which is more like constantly watching your back and fighting for survival in some sort of prison exercise yard. Many conversations were had along the way and I had the pleasure of meeting Andrew Hyde of Hyde Bicycles who also allowed me the privilege of test riding the belt driven bamboo bicycle that he built by hand and brought along on the night. I was truly in awe of this machine – everything from the bamboo tubing that he acquired and treated himself to the hand laid carbon fibre joins and carefully assembled drive train. 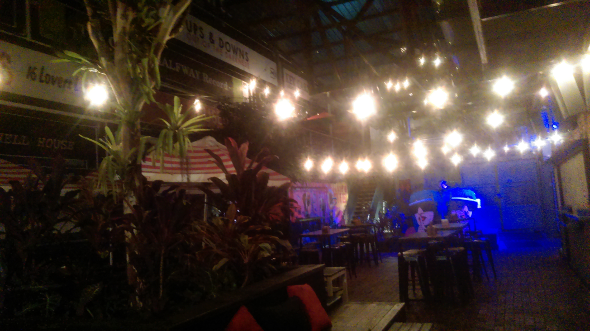 They say that all things must come to an end but this evening wasn’t stopping until we had visited one of Brisbane’s finest establishments for music, drinks and food – none other than The Triffid where we wound down over a few drinks and talked about more of the important things in life. 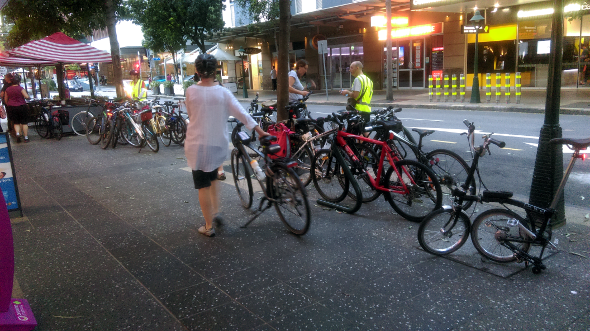 And finally, it was time to idle the Brompton up the hill toward Bowen Hills station and head home. The Streets Of Your Town music Heritage Ride is slated to happen again for next year’s Bike Week but in the meantime, there’s still some juice to be squeezed out of this year’s installment so be sure to check it out. Sounds like a nice way to spend the evening. Bamboo frame looks amazing. Wonder how it handles. Yeah, really good night with a great bunch of people. The bamboo bike was a really comfortable ride and the belt drive was smooth and silent.